The cutworm is also known as black cutworm, brown cutworm, pink cutworm and common cutworm. 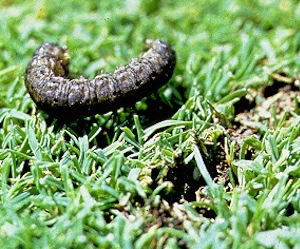 Cutworms can be extremely difficult to identify because they are named after their behaviour of chewing through the stems of lawns and plants and not on a single caterpillar type. As such they can often look quite different from each other - hence the common names listed above. Their colours can range from a bronze colour to brown, to green and sometimes they even have a variegated pattern. They are caterpillars of night-flying moths that lay their eggs in the soil. After the caterpillars emerge they chew young plants and seedlings at ground level, sometimes eating right through the stem, which falls over. They take shelter in the soil during the day and emerge to eat at night. Their food of choice is to attack seedlings but they can also affect soft fruits like strawberries. Cutworms are more likely to be active after periods of rain. Apart from being differentiated from other caterpillars by the way they cut through stems of plants and lawns, they are also recognizable by they way they curl up when touched. Cutworms can be from many different moth types but belong in the family Noctuidae.